1) changed his Facebook status from ‘it’s complicated’ to ‘engaged to Vladimir Putin’? 2) updated his LinkedIn profile, deleting ‘CEO, Syrian Arab Republic, 2000-2013’ and adding ‘Bashar al-Assad has a new connection: Ban Ki-moon’? 3) finished listening to one of his favorite iTunes tracks, 99 Problems, a song in which rapper Jay-Z describes in graphic detail his experience of being racially profiled by a police officer who wants to search his car? According to a well-informed source close to the al-Assad family, this hip hop classic always manages to turn the Syrian strongman’s frown upside down. 4) read a short, strawberry-scented note that was slipped to him by the President of the United States: “You’re naughty! Sleep on it and we’ll talk in the morning. Enjoy the chocolates. Yours, Barack”? 5) downloaded to his iPhone 5S the execution by firing squad of North Korean leader Kim Jong-un’s ex-girlfriend, pop star Hyon Song-wol – best known for her hit song “Excellent Horse-Like Lady”? 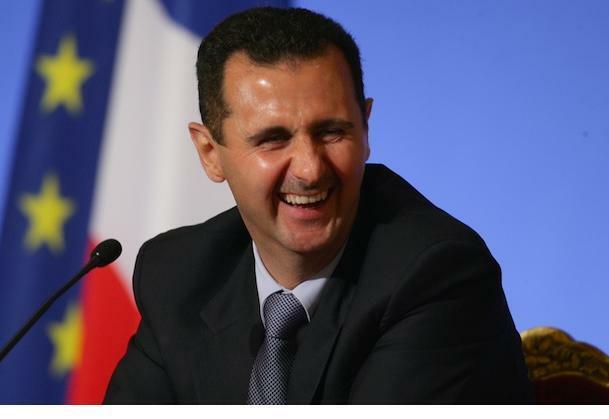 Why do you think Bashar al-Assad is grinning like a Cheshire cat? Share your thoughts by visiting http://www.JSMstateofmind.com.